Even if you’ve never had root canal treatment, you may dread the procedure, just because of jokes or tall tales! The fact is, a root canal treatment is just that: it treats a problem or infection and relieves inflammation or soreness. In most cases, you will not have any discomfort during a root canal procedure. At the dental office of Drs. 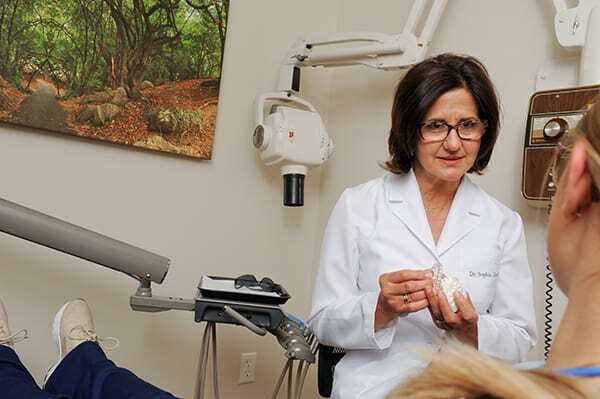 Sophia and Alexander Masters in Clinton Township, we do everything we can to make sure you’re relaxed, comfortable, and as pain-free as possible for all of our procedures, from filling a cavity, to periodontal therapy, to…root canals! The pulp cavity and root canals of your tooth contain the blood vessels and nerves that your tooth needs to thrive. If these tissues become injured or diseased, infection can set in, and will need root canal therapy. How do the doctors perform root canal treatment? When we perform root canal therapy, we treat the infection and remove the infection inside the pulp and root. After cleaning out any bacteria or debris, we then fill in the root canals to replace the tissue to help seal out bacteria to prevent future problems. The root itself remains intact. Once the root canals have been treated and filled, we’ll generally reinforce and help protect your tooth by placing a porcelain crown over it. This can also help prevent future damage or infection and preserve your natural tooth. Call our dental office in in Clinton Township at 586-463-8635 if you’re experiencing any ongoing tooth discomfort. Root canal treatment is just one of the many dental services we provide, and we’re happy to discuss cosmetic dentistry, or general or restorative dental care.